Since its inception in 1970, WestAir (formerly known as San Diego Welders Supply) quickly became one of the largest independent distributors of gases, gas equipment and welding supplies in the Southwest. Founder, Andy Castiglione, who previously worked for a larger company, recognized the need for improved customer service in the equipment supply industry. To fulfill his goal, Andy and his wife Sue, took a gamble and founded San Diego Welders Supply and quickly began the process of building on the principle of exceptional customer service. Sales grew exponentially and the company quickly expanded as every employee put into practice the company's philosophy of special, one on one, customer service. Andy and Sue embraced their future and never looked back. 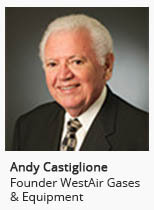 Andy and Sue’s son, Steve Castiglione, joined the company full time in 1980. Prior to joining the business, Steve worked as a welder in the San Diego shipyards, then worked his way up by pumping cylinders and driving a route truck before working on the management team. His experiences working his way throughout the company prepared him to eventually lead the family business and he was named President in 2000. As President, Steve continued to instill the same values of exceptional customer service that guided the company to its success. As the company expanded through acquisition and an added focus on gases and delivery systems, the founders changed the company's name from San Diego Welders Supply to WestAir Gases & Equipment, Inc. The new name became official in 2001 and more accurately described the company and its goals for growth. In 2013, WestAir expanded into the North Texas market through an acquisition of Ward Welding, based in Springtown, TX. The year 2014 opened with two more acquisitions: North Texas Welders Supply and Melo's Gas & Gear. Based in Fort Worth, TX, North Texas Welders Supply gave WestAir a second location in Texas. 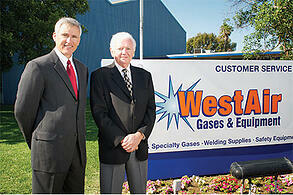 Also in 2014, WestAir completed an acquisition in Bakersfield, CA with Melo’s Gas & Gear. Melo’s gave WestAir 6 more retail locations, another high pressure pumping facility and acetylene plant. The Melo’s and Ward acquisitions brought WestAir the continued atmosphere and spirit of a strong independent company while continuing their focus on exceptional customer service. The overwhelming commitment to traditional values were alive and well in both companies as they united with WestAir. Today, WestAir is still a family owned business, serving customers in California, Arizona, and Texas with 17 locations and over 200 associates. WestAir generates just over $70M in revenues while it continues to exemplify a simple philosophy of taking care of their employees who are ultimately responsible for taking care of their customers. Everyone in the company embraces their overriding philosophy of "Large Enough to Serve, Small Enough to Care."